With the World Cup throwing up some really unusual results it can be hard to make money during the competition. Germany is out for the first time since it was black and white and we have seen England smash Panama 6-1 including 2 penalties. At least we can all relax knowing that we won’t meet Germany in a penalty shoot out. I think the last time an English player scored a hattrick in a World Cup game was Gary Lineker who scored one against Poland in the 1986 Mexican cup. Harry is currently in pole position to win the Golden Boot but the striker is only one ahead of favourites Christiano Ronaldo and Romelu Lukaku with five whilst they have four each. Kane faces off directly against Lukaku in the final group stage game, while Ronaldo’s Portugal tackles the stubborn defence of Iran. The English game versus Belgium is the one to watch as I did have an antepost bet on both Belgium and England to reach the quarter finals. 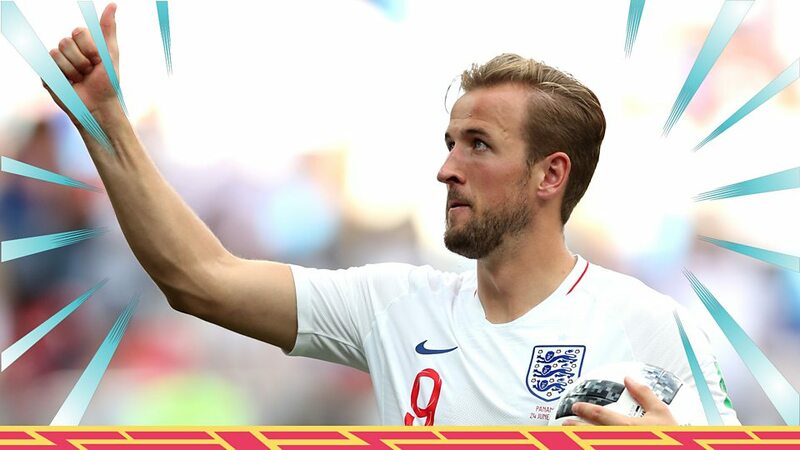 Will the English play as well as they did in the 1st half versus Panama and have the luck Harry Kane did in the 2nd half with an accidental deflection putting him in golden boot position? With teams like South Korea beating Germany 2-0 and Brazil drawing 1-1 with Switzerland and only beating Costa Rica 2-0 in extra time there could be an upset with a team no-one expected to win the cup (like England). Add that to Argentina losing 2-1 to Nigeria and 3-0 to Croatia, placing large bets on the favourites, players to score, teams to win, both teams scoring and accumulators build from similar bets, then the chances of losing lots of money in this World Cup seems quite high due to the nature of the results and poor playing of teams expected to do well like France. 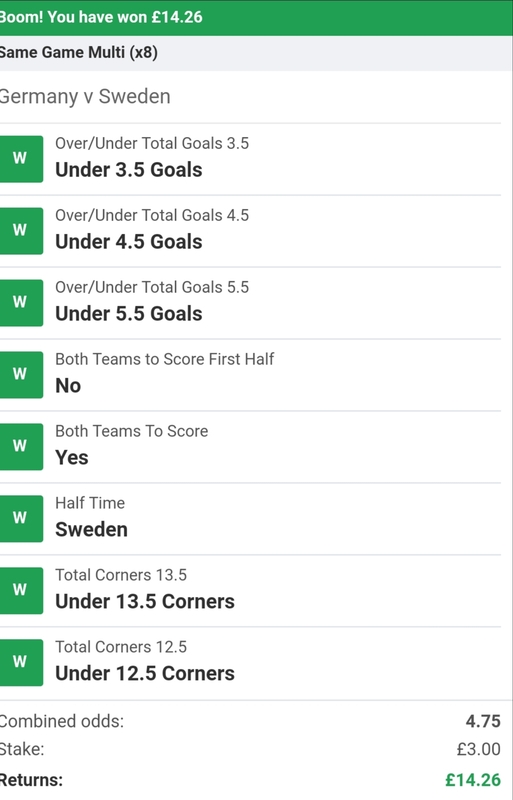 What I have been doing is using Betfairs brand new “Same Game Accumulator” option under Sportsbook when you click on a match and then the “Same Game Multi” tab you will be able to select numerous bet options to build up an accumulator just for that match. For example you could choose Brazil to win the game, be winning at half time, both teams to score in either half and more. The number of corners (over/under 10.5, 11.5, 12.5 etc), the same with goals. Score over/under 0.5, 1.5, 2.5, 3.5. Players to score, players to score 2 goals or more and so on. It really does have most of the usual accumulator options under it. This means we can use it for our advantage. I have been making a tally table up with all the kinds of bets that I have placed and then ticked those bets that come in as I wanted. This way I can see the majority of the bets that have a good win ratio and some are 90-95% correct. I even bet inplay like the Brazil bet I just did to go in winning at half time lumped onto all the other standard winning bets. Very rarely do I pick the winner or who will be winning at half time. I don’t pick players to score hat-tricks, or even to score at all. I try to keep the bets non team specific and go on my tally of bets. For example Brazil just scored against Serbia in the first half. I wouldn’t have put a bet on them to do so but if I was being risky I would say there would be a goal scored in the first half. Adding up these harder to achieve results together and putting a bet on them can give you odds of 2.5 – 3.5+. If you have a team like Russia did in their first game against Saudi Arabia then it’s wise to put Russia in as a winner and maybe a winner of both halves as well to increase your odds. These are some examples I did earlier placing only a few quid but at least doubled my money. I try to get to £100, remove £80, then start again with a score. If I had more money I would place bigger bets but I want to see how these teams perform first as it’s been a very up and down competition. For example will England beat Belgium in the same fashion as they played against Panama or will they fall to bits like they did against Iceland in the 2016 Euros? 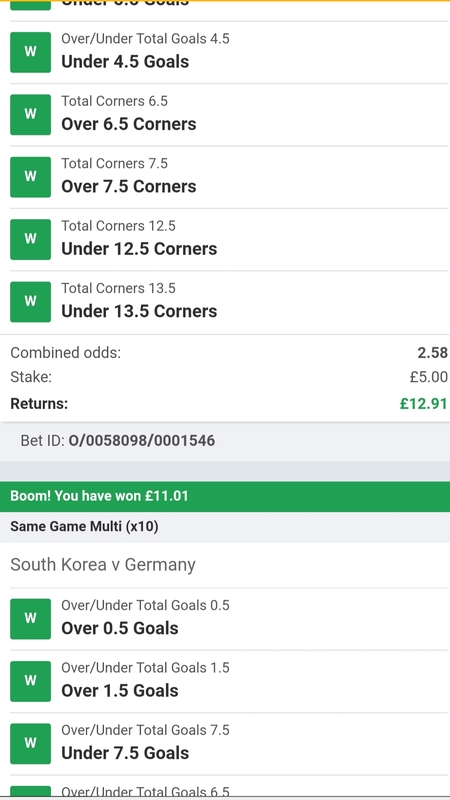 The best way to make money I have found is not to back a team but back goals, corners, red cards and other likely winning bets no matter their odds together so that when added up they combine to give you at least double your money if they all come in as winners. Save the England to be winning at half time and win the match v Belgium for a fun bet and treat it as such. It’s not a sure fire way to make money.